The spatial distribution of population in the basin is influenced by a number of factors among which are climate, rainfall, soil fertility, mineral resources, and social and economic infrastructure (transport, education, health, telecommunications, and hospitality sector facilities). The influence of water availability (in the form of large water bodies or rainfall) appears to overshadow other factors. In the most downstream countries – Egypt and Sudan – human settlement is mainly concentrated along the course of the River Nile. For example, population density is very high in the Nile Delta and Nile Valley in Egypt, yet these areas represent only five per cent of the country’s land area. In the upstream parts of the basin, the pattern of human settlement mainly follows that of rainfall. The highest population densities in the upstream countries are in the Ethiopian Highlands and the Nile Equatorial Lakes Plateau – both regions of high rainfall. 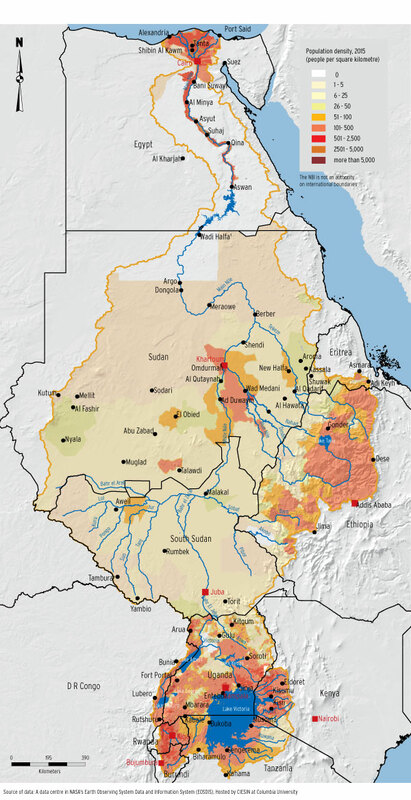 Whereas large parts of DR Congo, Eritrea, Kenya, and Tanzania are sparsely populated, there are parts of these countries within the Nile Basin that are densely populated as they fall in the high rainfall belt.